Welcome to GWT Tutorial series where we will explore how to create a GWT application. This is the second part of the tutorial and it is about RPC, and Datastore from Google App Engine. To simplify the content, the Login service is ignored. That means you don't need login to add a note. The sample application finally looks like this. Create a client side code. This is all about simple GUI app implementation. Instead of using Swing Component, you use Component from GWT. Communicate to Server with RPC. Here is the part required more attention. User Google DataStore data. The cool part is here. In order to complete a RPC call, three steps will be evolved. 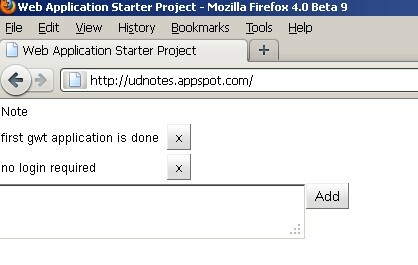 The comments in UDNotes class explains the 3 steps in detail and useful to understand the process. 1) An interface with extends RemoteService that lists the service method you need. 2) An asynchronous version of the interface above. 3) An implementation of the service which extends RemoteServiceServlet implements NoteService. 1. Create a NoteService interface under "client" package. 2. Create an asynchronous version of the interface under "client" package. 3. Create a Note class under "server" package. This involves with how to use JDO to store data. 4. Implement the service implementation under "server" package. 5. Edit the web application deployment descriptor (/war/WEB-INF/web.xml). 6. Edit UDNotes.java under "client" package. // generated proxy implements the asynchronous interface automatically. // Create table for Note data. // Assemble Add Note panel. // Associate the Main panel with the HTML host page. // Move cursor focus to the input box. // Listen for mouse events on the Add button. // Listen for keyboard events in the input box. // Don't add the Note if it's already in the table. // (2) Create an asynchronous callback to handle the result. // 'callback' will be invoked when the RPC completes. // Add the Note to the table. 7. A real application is a good way to show how it works. This example is very basic, more functions can be added, such as login service, access control, etc. i have one urgent question. How do I make a data that persists for every other user that access website? much like comment box for many websites. You write something, it stays on the website for everyone to see.